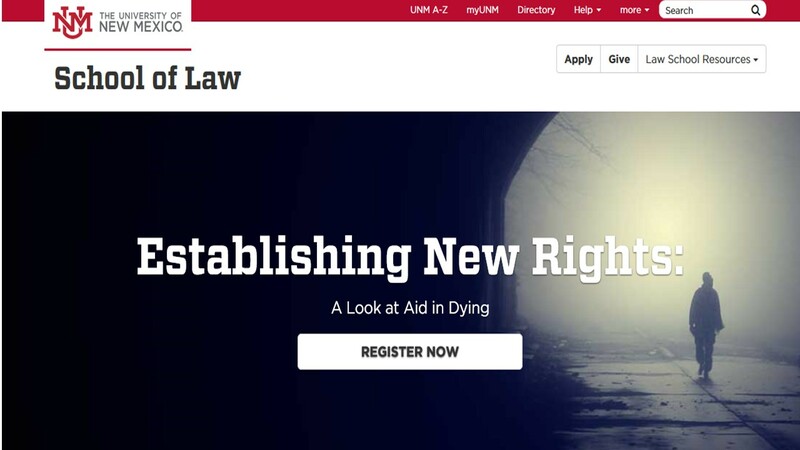 Join me in at the University of New Mexico Law School in Albuquerque on September 23 for "Establishing New Rights: A Look at Aid in Dying." Erwin Chemerinsky, Dean of the University of California Berkeley School of Law, will provide the keynote address on the history of state constitutions in providing civil rights. New Mexico Supreme Court Justice Charles W. Daniels will present on the New Mexico Supreme Court�s history of interpreting its constitution to establish civil liberties. Panels comprised of New Mexico judges and legal experts will discuss the topics of Aid in Dying and the role of state judiciaries. State legislatures and supreme courts throughout the country are confronting the controversial subject of aid in dying. An emerging issue is the role of the judiciary when the state constitution is vague about civil rights. The New Mexico Supreme Court was one of the latest to address the issue in Morris v. Brandenburg. The district court�s ruling that physician-assisted dying is a right under the state Constitution was overturned first by the New Mexico Court of Appeals and then in 2016 by the New Mexico Supreme Court. The New Mexico Supreme Court proclaimed that that the matter should be resolved in the executive and legislative branches. This year, the NM Senate rejected a bill that would have allowed physician-assisted dying. In this Symposium, national scholars and local experts will explore aid in dying from medical and legal perspectives, the background of Morris v. Brandenburg, and how other states have tried or succeeded in legalizing aid in dying.